Australian military aircraft are carrying out aerial surveillance of Papua New Guinea's earthquake-hit Southern Highlands region. 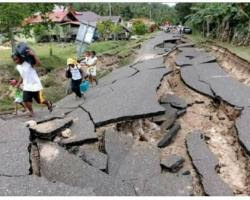 A 7.5 magnitude quake struck the region on Monday with reports of up to 30 deaths. Foreign Minister Julie Bishop said a team from Geoscience Australia was helping to monitor seismic activity and an Australian specialist was assisting the PNG Natural Disaster Centre. “We are saddened to hear reports of lives lost and many people being injured,” she said. Bishop has offered PNG further help if requested.